This Morning I threw out worrying, it was getting old, making me old, and just in my way. It kept me from being me; I couldn't do things God's way. I went through my mind and filed away "MY PAST" (didn't have time for it anyway) gotta stay focused. But I replaced it with, "My PRESENT and FUTURE" been thinking about it all day long. I am throwing out HATE and BAD memories, (WOW it is amazing how I treasured them so and how hard it IS to get rid of them even now....but they have got to goooo....GOING GOING...Im almost there...lol). Got me a new way of THINKING too, threw out the ones from long ago last night. Woke up this morning and found some THINKING left in the trunk of my mind (Whew that thinking had been in my trunk for so long...you should have seen the dust...flared up my hayfever so bad...my eyes started watering and itching, I was sneezing...I had to take me some Tranquility). As I was cleaning (because I was so frantic) to find out what kind of thinking they were...I started crying for joy. This is what I had been looking for, my postive words, "I CAN", "I WILL", "I MUST", and "I AM STRONG I CAN DO THIS". Right now I am throwing out I MIGHT, I THINK, I Ought, and that cozy song I keep singing and wasting so much of my time sangin, "If I COULDA WOULDA SHOULDA" (yall feelin me...same old song...you sang it before). I ran across an OLD FRIEND, I hadn't talked to in a while. His name is GOD the Father, and I really like His style. He helped me to do some cleaning and added some things Himself. Like PRAYER, HOPE, FAITH, and LOVE. Yesssss... I filed them right in the forefront of my BRAIN. Now Drama, Holding Grudges, not Accepting what Cannot be Changed, and just being ANGRY at the world...has been hard to find...Im still looking for them...need to find them fast... Cause I have some other old school songs that I sing real loud...over and over....and over (its like the battery just recharges on its own). Remeber, " Why Meeeeeeeee", "What Did I Dooooo", "I Dont Deserve Thisss", and "Its My Fault (one of my favorites) is somewhere...and I got to find them fast because I picked up this thing (it was over in a corner filed way way in the back of my BRAIN). I guess I just forgot about them....but I remembered and they are mine now). I placed it at the front of my attic door there called "PEACE of Mind", "PATIENCE", and "TOLERANCE". Soon Nothing and I mean Nothing will be getting or keeping this girl down (just gotta keep working at it everyday and making sure that I never never ever forget so I wont go back....but FORGIVENESS thats another thang ohhhhhhhh yeahhhh its called FREEDOM from the dark hole that I created and lived in for a long long long time). 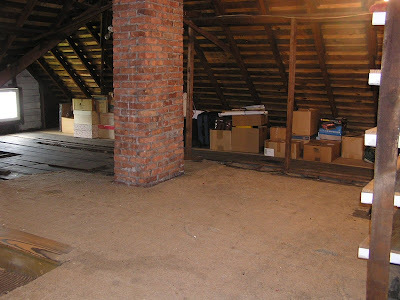 Oh YEAHHHH...I've got my attic looking pretty good right about now. Inner Calmness, Together with a Sense of Freedom, negative Thoughts and Worries will cease. Stress, Strain, and Fear will be moving on to the back of the Soul Train line. Inner Peace will be helping me to see clearly and the darkness will start to fade...huh I decided to see my own light at the end of the tunnle. Going back out to that trunk though ...cause I know I left Humble, Thankful, Grateful, and truly Blessed out there (Im gonna have another hayfever attic from the dust but it will be well worth it and Tranquility really works). WORRY, TROUBLE, and DRAMA just can not be in my space and I refuse to allow them to take up and take over my ATTIC. Oh and Im getting rid of Mr. Negative (it just takes up to much energy and makes me tired). Whew it was good to do a little attic cleaning. It sure made my day brighter; and Inner Peace ultimately will lead me to External Peace. By me creating peace in my inner world, only me will be able to bring it into my external world. My SUNSHINE will be affecting other people and U 2...(lol...watch out gurlllll!!!!!!!!!!!! Preach). I have a long way to go...but it is a start...this is my start. I am learning to stay quiet...so that I can hear...I am learning to listen and if wanted to tell my story...I have a gift...and that is to help those that are and have walked in my shoes. "Its called Respect" Whew thank goodness...I never lost that" Maybe you should TRY IT YOURSELF. BE BLESSED AND BE A BLESSING TO SOMEONE ELSE!!!! Awww mayn this is what i have been doing that's why I disappeared for while. Confronting yourself is hella hard.